Well, it’s finally here after what seems like an age in preparation. 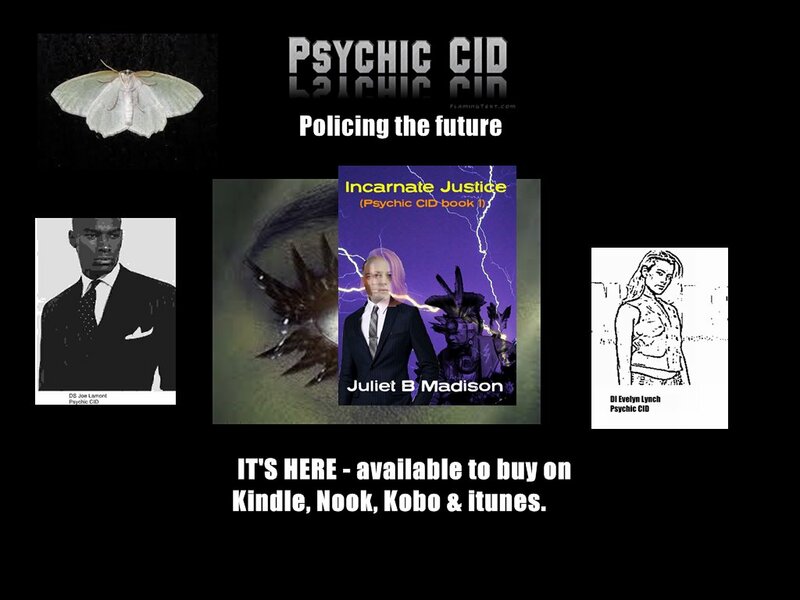 The first Psychic CID book Incarnate Justice is officially released. This book has existed in thought for several years, but it’s only in recent months I’ve finally gotten around to getting it down on paper. It’s a story of redemption and justice. It was supposed to be my first ever police procedural novel, but as I was new to that genre at the time I decided that writing the murder mystery, with all its quirks, would be too much to cope with on top of the spiritual dimension. That original police procedural ended up as Second Chances, the first title in the DI Frank Lyle Mystery series. The only spiritual dimension was that one of the characters was a Hindu. Now I’ve flexed my police procedural muscles I felt more confident in running two major plots lines together. I’ve decided to do the cops with psychic powers dimension as I wanted to come up with a paranormal story with a difference and there are no witches, vampires, shifters or zombies in sight. The book takes place in an alternate future, where psychic powers will be more acceptable, although sadly having psychic powers does not make the dreadful Ashbeck police canteen coffee more palatable. It truly is beyond redemption. This is the blurb for Incarnate Justice. In 2015 thirteen-year-old Ellen Shaw disappeared without a trace. No traces of her alive or dead were ever found and the police dismissed a Psychic’s help. Newly promoted DS Joe Lamont has been plagued by disturbing dreams since his early teens and he feels a connection to Ellen that he can’t explain. Will Lamont’s intuition prove to be a hindrance or a help and can Psychic CID solve the case and get to the truth about what really happened to Ellen? DS Joe Lamont is the Psychic CID newbie and reluctant hero of this story; he’s young and keen to impress, as well as being quietly confident in his psychic abilities. He finds himself right in the centre of things, without asking to be. He’s also single and rather good looking. He is accompanied at all times by his Native American spirit guide, Running Fox. Any interested female party; well she’d have to be psychic too because Lamont and Running Fox come as a package deal and if she can’t accept who he is then it just won’t work. There is no one in his sights right now, but he may well find a love interest in a future psychic CID book. Please keep an eye on Twitter and the Psychic CID launch event on Facebook. I’m also running a competition to win a personally signed Incarnate Justice paperback. You can find out more about this by joining the Facebook launch event. The closing date is Tuesday 1st December 2015. Only email entries will be accepted. Comments on the launch event post will not be counted. Put Incarnate Justice Paperback competition in the subject field. Finally here is an excerpt from Chapter 1 of Incarnate Justice, which is a direct introduction to DS Lamont. Lamont got up and wandered into the en suite bathroom. He turned on the light and peered into the full-length mirror. He was naked for it was unexpectedly warm for late September. He grimaced as he glimpsed the dark circles under his chocolate brown eyes. His cocoa coloured skin glistened with cold sweat and he felt a shiver run down his back. The fingers of his right hand tingled, an indication of Spirit presence. “It’ll be okay, Joseph.” A female voice said and the mirror misted over and cleared to reveal a diminutive grey haired woman standing behind him, his late mother Dolores. She was the only person who had ever used his given name, whether she was mad at him or not. He had never liked the Biblical implications of his first name and much preferred to be called Joe. “You will understand soon enough, son,” Dolores smiled. It was not a knowing smile so Joe surmised she knew no more than he did, which, he reminded himself, was precisely nothing. “I wish I knew now,” he grumbled. One last thing. If you read Incarnate Justice please leave an honest review from the site where you purchased it. This is my first foray into paranormal fiction so I’m especially interested in your views. You can get your own copy of Incarnate Justice on the usual Ebook sites. Please leave a review when you reach the end.